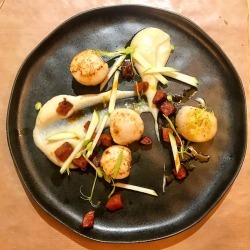 Le Cinquieme Jour is the creation of Chef Walter el Nagar an art curator turned chef from Milan who began his culinary journey in Italy and developed his skills throughout Europe, Mexico and the USA. Chef Walter also known as The Mad Chef has gained an international reputation for his dynamic and evolving menus and pop-up restaurant concept that has been seen in Los Angeles at the Barbershop Ristorante, Barcelona, Ibiza, Moscow, Tulum and Singapore. Part of this unique experience is that there are only 12 seats at the Chefs Counter at Le Cinquieme Jour – a semicircular wooden table in front of the kitchen creating intimacy and close involvement with the chefs at work. Chef Walter believes that too often the experience of gastronomic cuisine is reserved for a privileged clientele. So, he is changing this paradigm by opening up this culinary experience to the community on The Fifth Day (Le Cinquieme Jour). On the fifth day the same menu that is offered to the public on the previous 4 days will be offered free of charge to people in impoverished circumstances identified by their community partners; Serve The City, International Red Cross and Red Crescent Movement and Carrefour Rue. Le Cinquieme Jour is the first Chefs counter in Switzerland with a continually changing tasting menu experimenting with seasonal and local tastes and the farm to table concept. 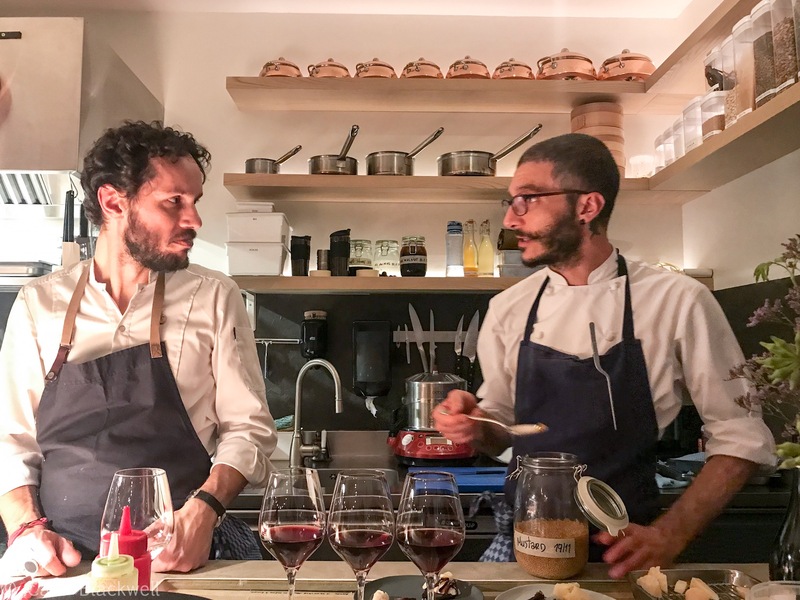 On the evening that we dined, Chef Walter had teamed up with an old friend and chef Marco Ambrosino from his restaurant 28 Posti in Milan to create a unique menu aptly named Project Collision 1 –they jointly created the menu, and each produced their own dishes. Watching them work together was a pleasure and eating the food they produced was a delight. The enjoyment that they gained from their ‘performance’ in the kitchen was infectious. It is Chef Walter’s intention to create more Project Collissions with visiitng chefs during 2019. Our amuse bouche was served with a crisp dry white wine a Jacqere Apremont from the Haute Savoie. The dish consisted of an amazing display of Cristal de capucine, tartelette comme une fondue, sphere des eaux du lac which had a crayfish inside and consommé de maquereau. This was followed by a delicious locally made sourdough bread, fermented butter made with Gruyere double cream and buttermilk churned to become fermented and a snow of Cenovis (Switzerland’s answer to marmite). Next we were served an oyster dish covered with charred cabbage – the oyster was chopped and mixed with an oyster mayonnaise. Then we enjoyed a nose to tail Omble Chevalier, chestnut and sage. The slightly aged and slow cooked Omble Chevalier was served with a chestnut milk alongside the fish skin which had been dried and fried. Under the skin was a ‘sausage’ made of the belly of the fish and roe. A slow cooked and very tender lamb dish served with eggs and lemon was our next gastronomique delight and this was paired with a light red 2015 Nebbiolo from the Val D’Osta. All of the wines served are organic, single grape and sourced from within 200 kilometres of Le Cinquieme Jour. The cheese course consisted of three ages of Romano cheese served with honey, black garlic and a small wild pear from Geneva. This plate wasn’t a looker but it tasted good! An extra final dish was a crystallised cerfeuil tubereux (root chervil) I would call this an acquired taste! Four chefs served this delicious and innovative tasting menu and the wines were served by Antonio the Wine Maitre d’. This intimate dining experience is a great concept and good if you happen to be dining alone. Lunch is 35 CHF per head and there is a vegetarian menu option. 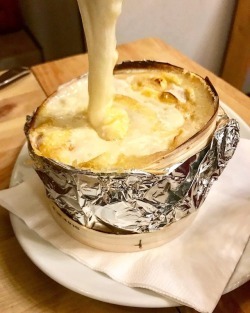 I enjoyed this dinner as a guest at Le Cinquieme Jour with my fellow foodie and friend Chene, the editor of Things to do in Geneva. I received no remuneration to write a positive review – these are my own views of my experience and I retain full editorial control.